Traveling between all of the Hawaiian Islands by boat is not a new idea. The ancient Polynesians, with their amazing courage and genius for navigation, first commanded these waters many centuries ago. In the years that followed, boat travel between the islands developed a long history. This tradition soon began to fade into memory with the advent of commercial aviation, but Hawaii Superferry hopes to honor the oceangoing spirit by making boat travel, once again, an important part of life here in the islands for locals and tourists alike. Hawaii Superferry aims to be more than just an alternative way to get from one island to the next. We expect our inter-island ferry service to change Hawaii for the better. The Hawaii Superferry lets you drive aboard in your own rental vehicle and park on the car deck with all your belongings within. Once on the ship, you’re free to roam, relax in the lounges, eat, drink, and conversate. Watch live TV or, better yet, watch the ocean go by with great views from your seat. Far from being a tiresome necessity, riding the Hawaii Superferry can be a wonderful stretch of your tripa time to unwind and enjoy yourself, a brief Hawaiian cruise. Upon arrival, you drive off in your own rental car, without having to touch your baggage or hustle for ground transportation. It’s not just a question of convenience or price; the Hawaii Superferry is likely to change the way you feel about inter-island travel. 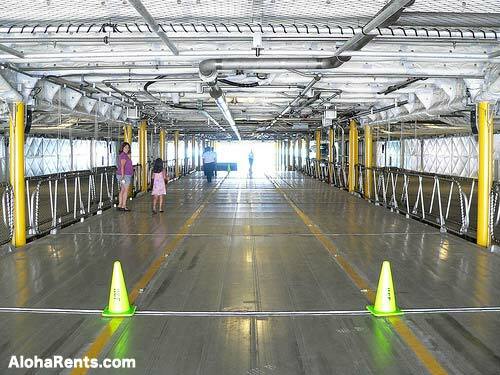 Note: Be prepared if you plan on taking your rental car on the Superferry. Rental car customers using the Hawaii Superferry must let your chosen rental service know about you plans. Ask for more information at the rental counter when you pick-up your car. Soon, we expect shuttle service to be made available between Hawaii Superferry and the rental car offices for both pick-up and drop-off. 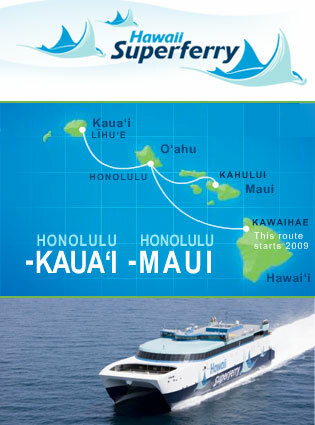 Current information and news about the Hawaii Super Ferry.